A Thunder-Rodd in GTA Liberty City Stories (Rear quarter view). 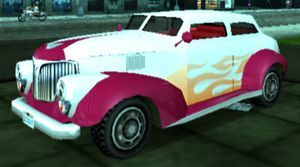 The Thunder-Rodd is an old fashioned hot rod type car that appears in Grand Theft Auto: Liberty City Stories. The car is distinguished by its 1930s/1940s coupe design (similar to a 1940 Ford), with significant modifications that evokes a "hot rod"-like design, complete with low ground clearance, wider wheels, a chopped rooftop, a flaming paintjob, and a red interior. Performance-wise, the car is considerably good, with considerably good acceleration and top speed. However, the car lacks in grip, resulting in less responsive cornering (the latter occasionally leads to the car sliding out of control), but compensates with good brakes. Dan Sucho owns a Thunder-Rodd, which appears in the mission "Grease Sucho" with a unique black-and-blue body color. Sucho's Thunder-Rodd can be stolen after Toni Cipriani kills Sucho. Following "Grease Sucho", the Thunder-Rodd can be found at the Old School Hall in Chinatown, Portland. The vehicle is wanted by Love Media. This page was last modified on 6 August 2012, at 22:39.